The following paragraphs summarize a number of projects I have described in my invited talk at the IEEE CLASTECH Technical Symposium (www.clastech.org) in October 2016. I would, however, like to emphasize that some of the projects described below have involved different people. To cite only a few, Dr. Trevor S. Bird, Dr. Graeme L. James, Dr. John S. Kot, Mr. Kieran J. Greene, Mr Ian M. Davis, Dr. Stuart G. Hay, Mr. Ross Forsyth, Mr. Karl Verran and Mr. Greg Pope. I am very grateful to all of them for their various contributions to the projects they were parts of. So, this article, prepared at the request of High Frequency Electronics, will give a summary of some of the major projects I have been involved with over the past 25 years. Again, I want to emphasize that all these projects are the results of great teamwork. My expertise is mostly in horn and reflector design and optimization, with some experience in designing waveguide feed network components. As this article is a summary of the work I have been involved with over the years, the references will therefore be mostly self-references but the papers cited will provide readers with a lot more details and extra references. The Nancay radio telescope in France is a transit telescope of the Kraus/Ohio State design with a fixed spherical reflector (300m long and 25m high) and a tiltable flat reflector (200m long and 40m high). The F/D ratio of the radio telescope is very high and originally used three “Hoghorn” feeds to observe at 1.4, 1.665 and 3.333 GHz. These Hoghorn antennas, in the 1990s, were no longer adequate in terms of efficiency and noise temperature. Thus, to keep the Nancay radio telescope at a good international level, the design and construction of a new optimized focal system has been undertaken. 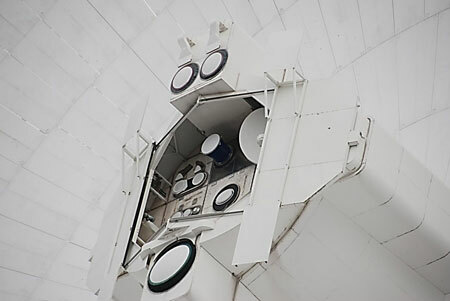 The new system uses two corrugated horns and two shaped reflectors in a Gregorian configuration to allow the radio telescope to cover the 1 – 3.5 GHz band. As a proof of concept before full manufacture, a 1/20th scaled model was manufactured and tested. The full system was then manufactured at the CSIRO Radiophysics Laboratory (Sydney, Australia) and delivered in 1997 and it has been operating successfully ever since. Reference: C. Granet, G.L. James, J. Pezzani. 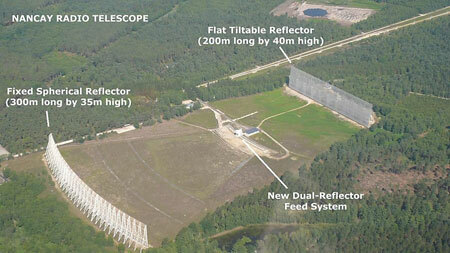 “A new dual-reflector feed system for the Nançay radio telescope’’. IEEE Transactions on Antennas and Propagation, Vol. 45, No9, September 1997, pp 1366-1373. The Nancay radio telescope in France. 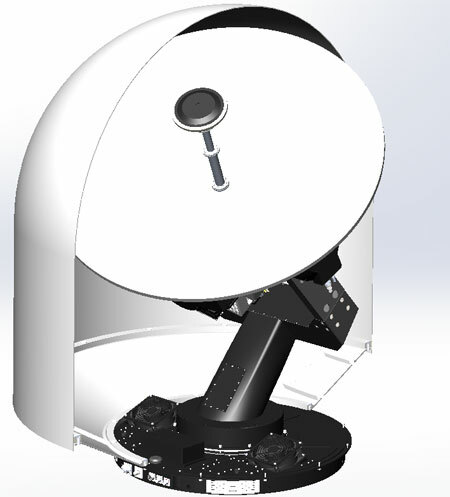 1/20th scaled model of the new dual-reflector feed-system. Over the years, I have been involved in the design of single band horns for radio astronomy, satellite communications and remote sensing. Bands like L, S, C, X, Ku, Ka, W and even THz. C. Granet, G.L. James, A.R. Forsyth. “Aperture Antennas: Waveguides and Horns”, Chapter 3 in “Modern Antenna Handbook”, Edited by C.A. Balanis, ISBN 978-0-470-03634-1, 2008, John Wiley & Sons Inc. Publication, pps 97-156. A.D. Olver, P.J.B. Clarricoats, A.A. Kishk, L. Shafai, “Microwave Horns and Feeds”, IEE Electromagnetics Waves Series 39, ISBN 0 85296 809 4. 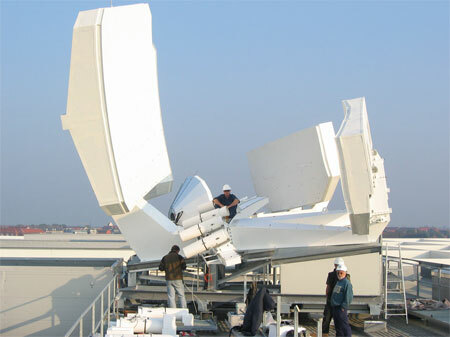 Example of a Ka-band feed system. 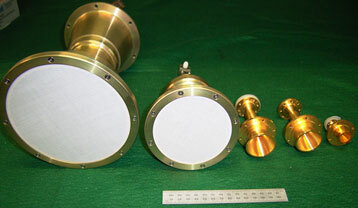 Dual-Band coaxial horn for Parkes. Over the years, I have been involved in the design, and/or manufacture and/or test of a number of dual-band or multiband systems like, for example: X/Ka, Ku/Ka, X/Ku, Ku/Ku-Reverse-DBS, S/X, C/X/Ku-Rx-only, S/Ka, L/S and L/S/X bands. 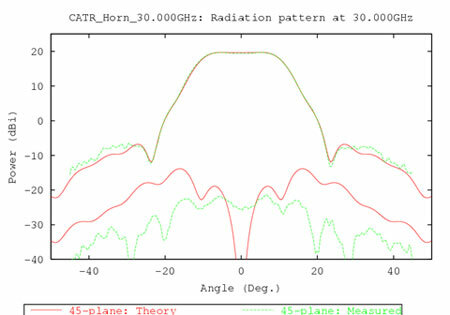 For example, I was part of a team that designed a prime-Focus coaxial horn for the Parkes radio telescope to cover 0.648 - 0.712 GHz and 2.6 - 3.6 GHz. The aluminium prototype of the low-sidelobe horn. C. Granet, H.Z. Zhang, K.J. Greene, G.L. James, A.R. Forsyth, T.S. Bird, R.N. Manchester, M.W. Sinclair, P. Sykes. 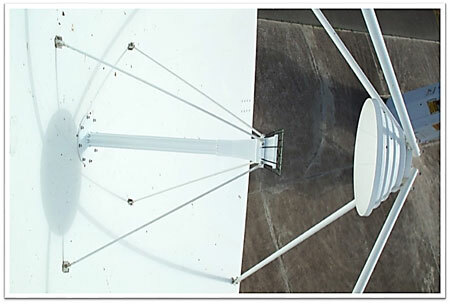 “A dual-band feed system for the Parkes radio telescope”, 2001 IEEE Antennas and Propagation Society International Symposium, Boston, MA, July 8-13 2001, Vol. II, pp 296-299. C. Granet, G.L. James, K.J. Greene. 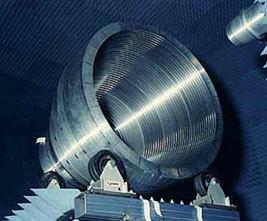 “Multi-band feed horns”, JINA’98, November 1998, Nice, International Symposium on Antennas, pp 635-638. 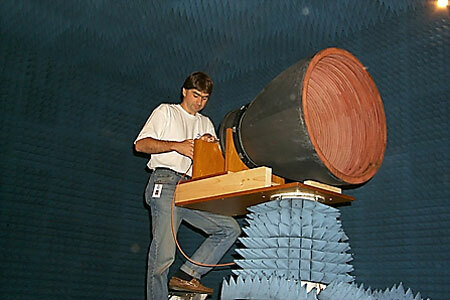 The lightweight low-sidelobe horn during testing. A new compact multimode S-band horn with low sidelobe was required for global earth illumination from a geostationary satellite. 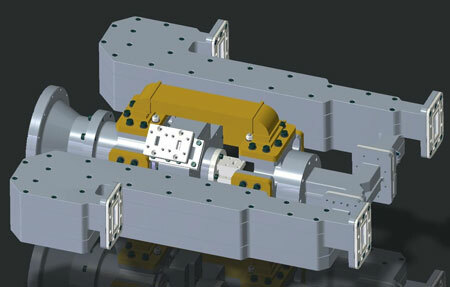 A very compact design was optimized to give the required beamwidth and sidelobe levels of the order of -35 dB. A prototype horn was machined out of aluminium and tested successfully. 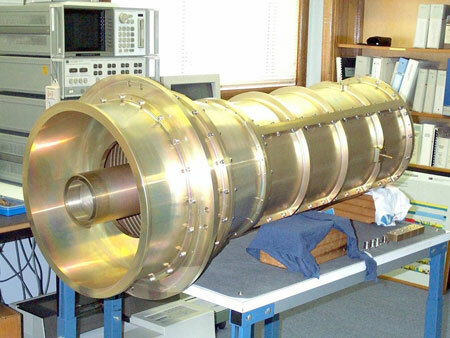 The prototype horn weighed in excess of 100 kg, which is way too heavy for a satellite application and a lightweight version of the horn, weighing only 9.3 kg was manufactured out of lightweight materials and successfully tested, also. C. Granet, T.S. Bird, G.L. James. “Compact multimode horn with low sidelobes for global earth coverage”, IEEE Transactions on Antennas and Propagation, Vol. 48, No 7, July 2000, pp 1125-1133. C. Granet, T.S. Bird. 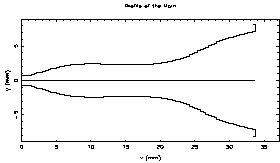 “Space-qualifying a lightweight corrugated horn with low sidelobes for global-earth coverage”, 2001 IEEE Antennas and Propagation Society International Symposium, Boston, MA, July 8-13 2001, Vol. II, pp 246-249. For a very long time, the corrugated horn was the gold standard for horns with a moderate bandwidth requirement and the Potter horn was the standard for narrow-band requirements. 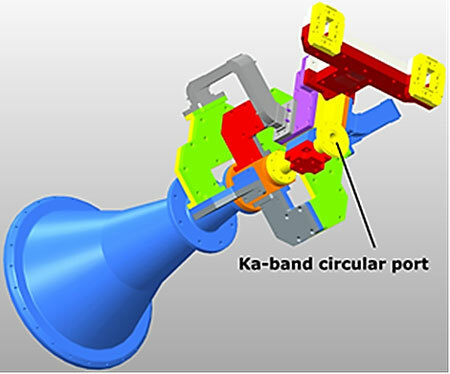 Both these designs work well, but for high-frequency applications and moderate to wide bandwidths, it has been necessary to find an alternative to a corrugated horn. The spline-profile smooth-walled horn is a possible alternative. 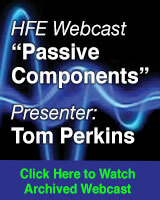 • Easier to manufacture (cheaper), especially at high-frequency. • Can be designed to be wide-band. • A compromise has to be made for cross-polarization. • Tend to be longer and with a larger aperture than corrugated horns. All in all, the spline-profile smooth-walled horn geometry has been applied to many applications and is now being used by many horn designers around the world. C. Granet, G.L. James, R. Bolton, G. Moorey. “A smooth-walled spline-profile horn as an alternative to the corrugated horn for wide band millimeter-wave applications”, IEEE Transactions on Antennas and Propagation, Vol. 52, No 3, March 2004, pp. 848-854. T.S. Bird, C. Granet, “Profiled Horns and Feeds”, Chapter 5, in the “Handbook of Reflector Antennas and Feed Systems”, Volume 2: “Feed Systems”, Artech House, 2013, ISBN-13: 978-1-60807-517-1, pps. 123-155. Corrugated and spline-profile geometry comparison. 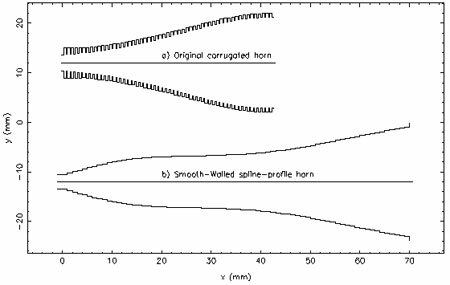 Corrugated horn (left) and equivalent spline-profile smooth-walled horn (right). 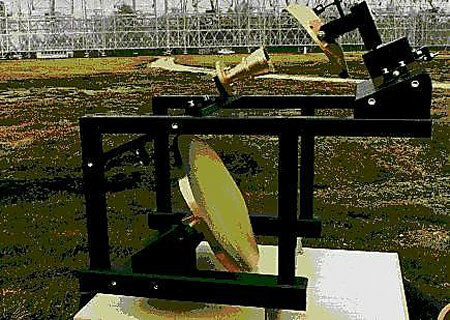 The CSIRO designed compact antenna test range (CATR) is based on a single parabolic offset reflector that has been machined from a single billet of cast aluminium plate to provide a RMS error of better than 16 micrometres as determined from photogrammetry. The design is unique as it leverages CSIRO’s ability to accurately design and manufacture feed horns with highly optimized radiation patterns; in this case, feed horns with flat amplitude tapers at the beam maximum and fast amplitude roll-off at the edge illumination angle of the reflector. 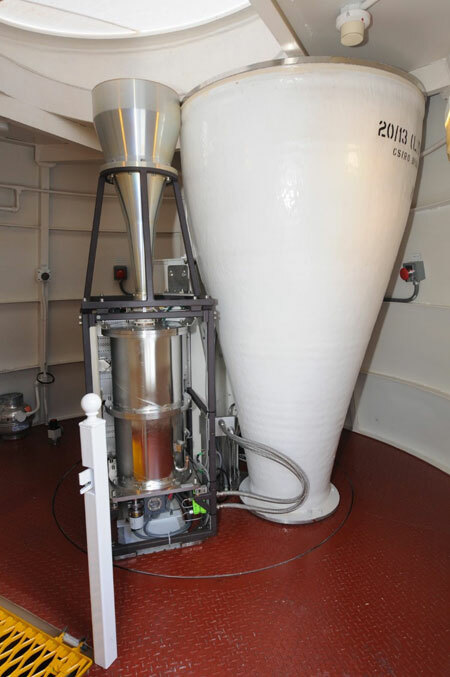 The advantage of using this type of feed horn is that it eliminates the need to specially treat the edges of the CATR reflector and therefore greatly reduces the cost of the system. The CSIRO CATR was designed to operate from 20 GHz and up to 200 GHz and provide a quiet zone of about 650mm in diameter at 200 GHz. 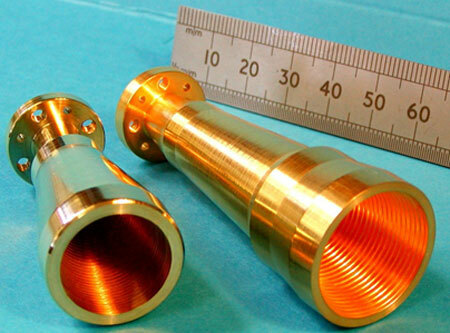 Two horn geometries are used: shaped corrugated horn for the low-frequency applications and shaped smooth-walled horn for the high frequency applications. Both types of horns were designed to give equivalent radiation patterns and can work over a 10% bandwidth. A number of horns were manufactured, as needed, to cover the frequency bands required for the various projects the CATR was used for. Reference: S.J. Barker, C. Granet, A.R. Forsyth, K.J. Greene, S.G. Hay, F. Ceccato, K.W. Smart, P. Doherty. “The development of an inexpensive high-precision mm-wave compact antenna test range”, Proceedings of AMTA, Newport, Rhode Island, USA, Oct. 30 - Nov. 4 2005, pp. 337-340. 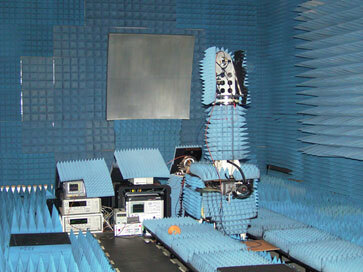 CSIRO compact antenna test range. Series of CATR horns (2 corrugated horns and 3 smooth-walled horns). Comparison between theory and measurement. Note the flat-top pattern shape with sharp roll-off. High-efficiency horns are important to give good illumination as individual feeds for shaped reflectors, and also in array feeds. In arrays, it is highly desirable that the elements have high aperture efficiency to maximize the gain for a given number of array elements. Also, high-efficiency feeds are important for shaped beams so as to maximize the edge of coverage gain. 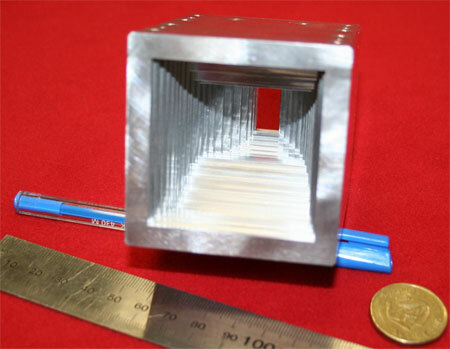 In arrays, the feed apertures are usually of small size to fit in the limited space and must have high efficiency over the operating frequency band to give the required illumination taper. Further, for satellite applications, these elements should be also as compact as possible for low ohmic loss and weight. I have been involved with the design of square aperture and circular aperture high efficiency horns where aperture efficiencies of greater than 95% are achieved. T.S. Bird, C. Granet. 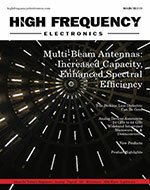 “Optimization of profiles of rectangular horns for high efficiency”, IEEE Transactions on Antennas and Propagation, Vol. 55, No 9, September 2007, pp. 2480-2488. T.S. Bird, C. Granet. “Design of profiled circular horn feed with high efficiency”, IEEE International Symposium on Antennas & Propagation, July 8-14 2012, Chicago, Illinois, US, 2 pages. I have been involved in the design, analysis and test of a number of reflector antennas. I have written easy-to-use technical papers on the design of classical dual-reflector geometries (Cassegrain, Gregorian, Displaced-Axis (Ring-Focus), Dragonian, etc. ), Circular-symmetrical or offset that provide simple formulas and step-by-step procedures. These papers have been well received and well referenced (got nice, unsolicited comments, from a few people around the world). All the papers were published in the IEEE Antennas and Propagation Magazine, in Tom Milligan’s “Antenna Designer’s Notebook” section and Tom has made all these step-by-step procedures available on the website http://antennadesigner.org/ among many other things. For military applications, it is sometimes necessary to have an antenna that can be used simultaneously in receive and transmit mode at both X-band and Ka-band. I have been involved in the design of a number of simultaneous X/Ka-band feed systems for either offset reflectors, compact dual-reflector systems or large dual-reflector earth station antennas. 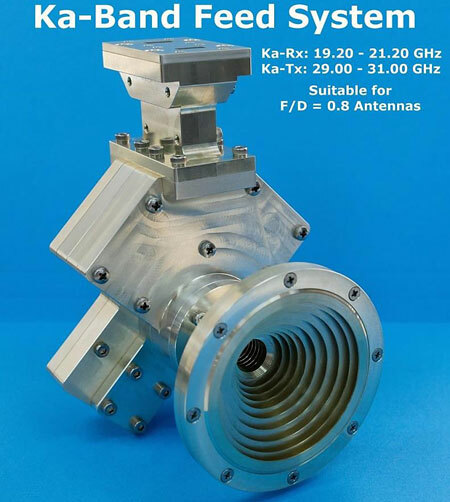 Ka-band Tx: 30.000 - 31.000 GHz. For F/D = 0.65 and F/D = 0.8 antennas (i.e., offset parabolic reflectors or compact dual-reflector systems). Simultaneous X/Ka feed system for F/D=0.8 antennas. X-band diplexer: Split-block construction, no tuning screws. Three systems delivered to NASA for the KaBoom 12m antennas at the Kennedy Space Centre (Florida). The three systems delivered to NASA. The simultaneous X/Ka F/D=0.8 eight-port feed system. Intended application: Wideband Global SATCOM (WGS). Polarization: RHCP and LHCP in all sub-bands, i.e., 8 ports. Monopulse tracking at Ka-band (LP and/or CP beacons). To meet the required gain over the X and Ka bands, an optimized smooth-walled spline-profile horn was used. 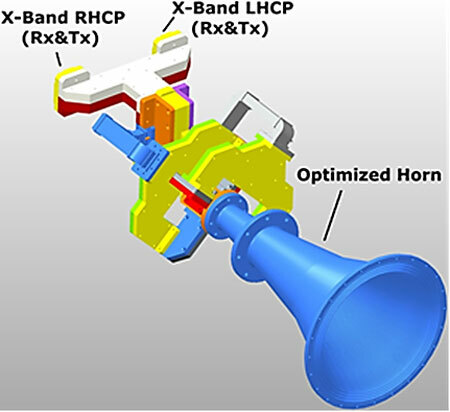 Following the feed horn, a six-port junction and waveguide network is used to provide LHCP and RHCP waveguide ports each covering the combined X-band downlink and uplink frequency bands. 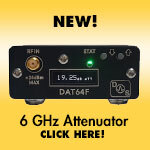 Addition of a pair of diplexers and a receive reject filter provides a full four-port X-band feed system. 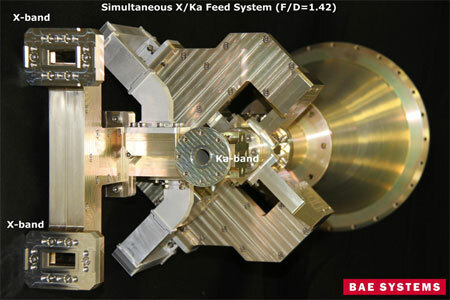 The Ka-band communications and tracking signals pass through the X-band network and are available at a circular waveguide port at the rear of the feed. For this application, the generation of the monopulse tracking signals and the RHCP and LHCP communications signals for the Ka-band downlink and uplink frequency bands is done in an external Ka-band waveguide network that is not shown here. 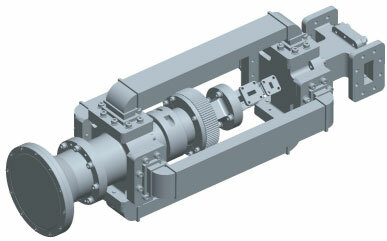 Simultaneous X/Ka feed system for F/D=1.42 (CAD Model, front view). 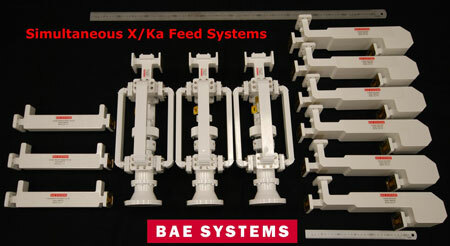 Simultaneous X/Ka feed system for F/D=1.42 (CAD Model, back view). Simultaneous X/Ka feed system for F/D=1.42 (Photo of the prototype, side view). Simultaneous X/Ka feed system for F/D=1.42 (Photo of the prototype, back view). C. Granet, I.M. Davis, J.S. Kot, G. Pope, K. Verran, T. Mellor, “A simultaneous X/Ka feed system for reflectors with a F/D ratio of 0.8”, Proceedings of the 5th European Conference on Antennas and Propagation (EuCAP), Rome, 11-15 April 2011, pps 1225-1227. C. Granet, I.M. Davis, J.S. Kot, G.S. Pope, K. Verran, “Simultaneous X/Ka-Band Feed System for Large Earth Station SATCOM”, Military Communications and Information Systems Conference, MilCIS’2014, Canberra, 11-13 November, 2014 (5 pages). The CSIRO ICT Centre has delivered two of its Ku-band MultiBeam antennas to Danish Radio for the new multimedia building in the Ørestad area in Copenhagen. This state-of-the-art broadcasting centre is part of Danish Radio’s consolidation of resources into one complex at DR Byen. The MultiBeam antenna can access up to 20 geostationary satellites simultaneously. It can substantially improve the operational flexibility of satellite broadcasting and significantly reduce capital, operating and service connection costs. Danish Radio is the second customer for the Ku-band MultiBeam antenna technology and follows the highly successful four-year operation of three such antennas at SES-ASTRA in Luxembourg. However, the DR Byen antennas will be the world’s first multibeam antennas providing both transmit and receive services into commercial satellite networks. S.G. Hay, S.J. Barker, C. Granet, A.R. Forsyth, T.S. Bird, M.A. Sprey, K.J. Greene. “Multibeam earth station antenna for a European teleport application”, 2001 IEEE Antennas and Propagation Society International Symposium, Boston, MA, July 8-13 2001, Vol. II, pp 300-303. T.S. Bird, C. Granet, A.R. Forsyth, M.A. Sprey, S.J. Barker, K.W. Smart, S.G. Hay, L. LI. “CSIRO 4.5m MultiBeam antennas for the new Danish Radio multimedia building in Copenhagen”, Workshop on the Applications of Radio Science, WARS’06, Leura, Australia, 15-17 Feb. 2006, 9 pages. 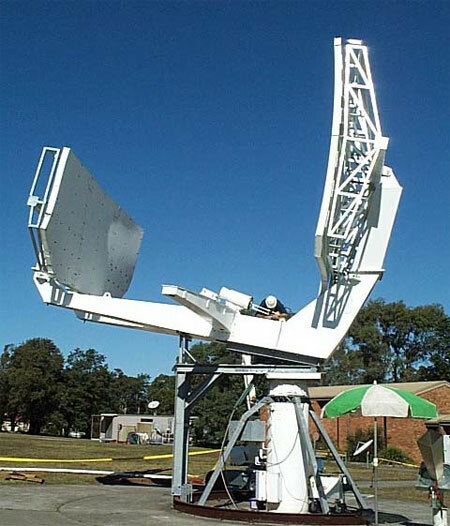 The Ku-band Multibeam Antenna under test at CSIRO. The two Rx/Tx Ku-band Multibeam Antennas at DR Byen (Copenhagen). SATCOM on the Move (SOTM) technology based on Ku-band and above has the potential to deliver robust, continuous, wideband communications to a range of vehicles while they are moving across different types of terrain. At these frequencies, the high antenna directivity required for wide bandwidth satellite communications can be achieved with antennas of relatively small physical size: hence the possibility of mounting the terminal on a small vehicle, and mechanically pointing the antenna while the vehicle is in motion. Electronic beam steering technology can in principle remove or greatly reduce the requirement for mechanically pointing the antenna, and so it represents a natural development path for SOTM antenna technology. However, at present it represents a very complex and difficult technology for SOTM, with several challenges to overcome. New satellite systems such as WGS give the opportunity for Ka-band SOTM operation. Operating at Ka-band exacerbates the problem of pointing the antenna due to the very narrow beamwidth, the wide separation between the transmit and receive frequency bands, and the stringent regulatory requirements. 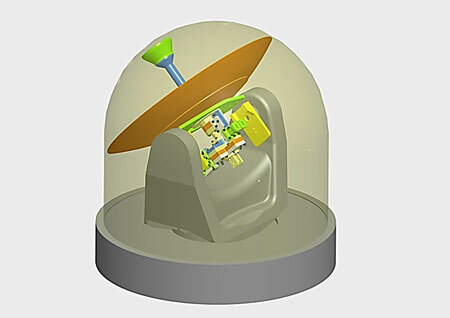 We have developed compact, shaped, dual-reflector system that include a monopulse tracking capability for a number of SOTM application. Most of these systems were developed in collaboration with EM Solutions (Brisbane, Australia). The development of compact dual-reflector systems is quite different from that of more traditional large earth station antennas and specialist methods and software need to be used to meet the sometimes very demanding sidelobe and cross-polarization requirements. G. Pope, I.M. Davis, C. Granet, J.S. Kot, K. Verran, “Compact shaped Ka-band dual-reflector system for SATCOM on the move applications”, Military Communications and Information Systems Conference, MilCIS’2010, Canberra, 9-11 November, 2010 (4 pages). I.M. Davis, J.S. Kot, C. Granet, G. Pope, K. Verran, “Compact shaped dual-reflector system for military Ka-band SATCOM on the move”, Proceedings of the 5th European Conference on Antennas and Propagation (EuCAP), Rome, 11-15 April 2011, pps 3674-3677. C. Granet, J.S. Kot. I.M. Davis, G.S. Pope, “Optimization of compact SATCOM terminals”, Military Communications and Information Systems Conference, MilCIS’2012, Canberra, 6-8 November, 2012 (5 pages). Ka-Band Military SOTM terminal for a vehicle application. Ka-band Military and Commercial SOTM terminal for maritime applications. 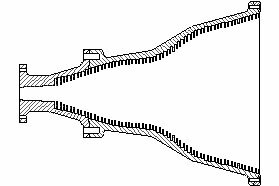 Corrugated horns are great, but the use of corrugations limits their bandwidth to 2:1 roughly using a ring-loaded slot mode converter or a variable pitch-to-width mode converter. Fancy dual-depth or tri-depth corrugations can be used for multiband applications, but each of the bands tends to have narrow bandwidth. Smooth-walled horns, highly optimized, seem to offer a good compromise if they are combined with wide-band mode launchers. I have designed a number of wide-band smooth-walled spline profile horns for a number of applications. I will only showcase two, each of which used in conjunction with a wide-band OMT designed by the CSIRO Astronomy and Space Science group. 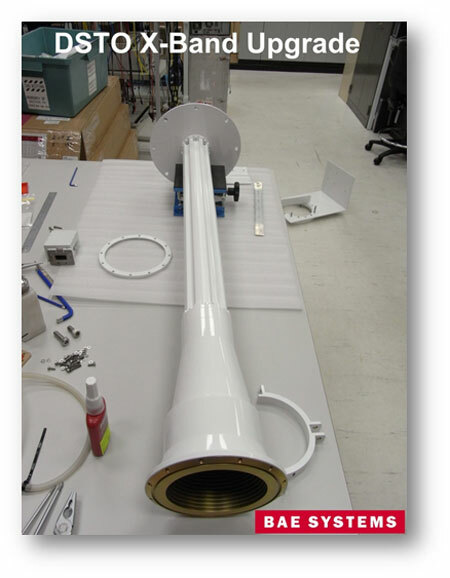 The first horn was required for use on the 22m shaped Cassegrain antennas of the Australia Telescope Compact Array and was required to cover the 4 – 12.25 GHz band. It has a -12dB @ 14deg Gaussian pattern requirement and very strict mechanical constraints on size and length. Originally, only two horns were required, then another four were delivered. The 4-12.25 GHz smooth-walled spline profile horn (on the left, unpainted) next to the big L-band horn. The 4-9.3 GHz horn for the Effelsberg 100m antenna. The second horn was required to cover the 4 – 9.3 GHz band and work on the Effelsberg 100m-diameter antenna operated by the Max Planck Institute for Radio Astronomy. This horn has a -12dB @ 7.38deg Gaussian pattern requirement and it is therefore very long and large. C. Granet, J.S. Kot, I.M. Davis, G.S. Pope, “Wide-band feeds for multi-band SATCOM and EW antennas”, Military Communications and Information Systems Conference, MilCIS’2013, Canberra, 12-14 November, 2013 (4 pages). J.S. Kot, C. Granet, I.M. Davis, G.S. Pope, “Wide-band feed systems for radio astronomy”, International Workshop on Antenna Technology, IWAT’2014, Sydney, Australia, 4-6 March, 2014 (4 pages). The 4-9.3 GHz horn on the antenna. New X-band feed system to re-band the old 4.6m Ku-band antenna. Reflector antennas are often large and expensive bits of equipment and it is sometimes necessary to use the antenna at other frequency bands. This is something done very often in radio astronomy, for example, but often overlooked in SATCOM applications. I have been involved in a number of antenna re-banding activities. The latest one for SATCOM was to transform an old 4.6m Ku-band antenna into an X-band antenna while the latest radio astronomy application was to enable a 30m C-band antenna to operate at X-band. Reference: C. Granet, I.M. Davis, J.S. Kot, G.S. Pope, “Earth-station upgrade from Ku-band to X-band”, Proceedings of the Military Communications and Information Systems Conference, MilCIS’2011, Canberra, 8-10 November 2011, 6 pages. The re-banded antenna with the new X-band feed system. Dr Christophe Granet is an award-winning antenna engineer with over 25 years’ experience in the design, manufacture and test of high-performance reflector antennas and feed systems for satellite communications, radio astronomy and scientific applications. He was the recipient of the 2001 HA Wheeler Award from the IEEE Antennas and Propagation Society, and has published over 140 peer-reviewed scientific papers and co-authored two book chapters on antenna design. From 1995 to 2008 he worked as a Principal Research Scientist at the CSIRO Radiophysics Laboratory, then in 2008 left to join BAE Systems Australia as a Senior Antenna Specialist. In 2015 he left BAE Systems to start Lyrebird Antenna Research Pty Ltd. Christophe is a Senior Member of the IEEE.